At one point, Americans managed to rule the industrial world and we apparently did it over martinis at lunch and water glasses full of bourbon moments after entering a house. Did you ever wonder how anyone could possibly have survived a three martini lunch and gone on to a constructive afternoon parlaying with the EVP on the QT, ASAP? In light of my New Year’s resolution (“two martinis, no more”) I wasn’t about to test out my productivity after swimming at lunch. But I did think to do a little scientific comparison. The photo above shows the cocktail glasses that I keep here at the manse. The silver lipped one was from my father’s dinner service. It is Rosenthal and was purchased in the 1950’s when he was stationed at the Army Garrison in Garmisch, Germany. A glass this size probably accounts for the old joke that the olive takes up too much room in the glass and so should be dispensed with. It holds 2 ounces, about what you’d expect the cocktail glass to hold that William Powell samples at the beginning of the first “Thin Man” movie. Were you counting? Six martinis…. at about two ounces each. Twelve ounces. Or just about two of the second glass pictured. The mid-sized glass is one from my father’s bachelor party on Governor’s Island, NY. That would have been at the beginning of the 1960’s and it holds 6 ounces. These are the glasses that I use most often as I am worried that I will break the older ones whilst washing them. The largest of the glasses is from a cocktail reception given for Mrs. E. and me on the occasion of our engagement, 1997. It holds eight ounces. One of these is the equivalent of four of the pre-1960’s cocktails. Three of them is almost equivalent to drinking an entire fifth of booze. The key word in his oft-quoted remark is “few.” As with anything, moderation is the key to maintaining elegance. If you can find the smaller glasses, buy them. Yes, you will get looks the first time you serve a drink in them, but eventually, your wisdom will win out. This entry was posted in Entertaining and tagged Gerald Murphy, martini, The Thin Man, William Powell. Bookmark the permalink. we used to play a game with the thin man series. A full bar was always near. We would drink as often as William Powell an Myrna Loyd would. I would try to explain to the snooty European that we were not at all like the movies. Besides that was the 30’s and 40’s! Still, we americans can drink most Europeans under the table! Reminds me of a quote from James Bond…”the downfall of the British Empire was tea!” The British were renowned coffee drinkers before tea came and ruined it all. Ladies, when your men come home stinking of booze, have the foresight to realize that in the long run they are real men. Never forget that Noah, who before and after he built the ark and saved humanity, was a roaring drunk who discovered wine…just something to think about when you want to smash the bottle on his head and take the children away. Why complain when he dresses well and treats you like a queen? He has a job doesn’t he? shaken, not stirred, olives please. Excellent post! I have a brutal story about being overserved [OVERSERVED, I say] by my favorite bartender ever at the Palm restaurant in Orlando one night with three of THEIR martinis [which seem to be about your “engagement” size] and then toddling to dinner in some manner or another with wines etc when my sorry partner showed up two hours late for a business dinner with twelve non-client mooks instead of the six clients he was supposed to be bringing. When they showed up, the barman put down martini 3 and said “I sense another martini is in order?”. He was right. No less an authority than Frank Sinatra said…”two martinis before dinner. No more. And no LESS.”. Amen. What a great post about portion sizes over the last 50 years. Living in Atlanta everything, EVERYTHING, seems to involve good ‘ol Coca Cola. I thought it was interesting to go to the new World of Coke museum and see the ever increasing sizes of glass bottles, then cans, and now plastic bottles. The first glass bottles were 6 oz, half the size of a modern can, before you even begin to contemplate the huge individual plastic bottles that admit to being 1.5-3 serving sizes. Enchanting post E. I do believe the glass sizes have increased with this culture’s appetites. The word “gorge” comes to mind. Errant Aesthete, Vaill’s book is what started this idea percolating in my mind. My first edition harback is coming apart at the seams. I’ve even sent copies to friends to read and Mrs. E. and I did a 36 hour jaunt to Yale via NYC to take in the exhibit last summer. I completely understand your addiction. Lovely posting! And the glasses illustrate the charm and wisdom of keeping your options open when considering the alchemy of mixing a martini. Size does matter. As for the phrase “the juice of a few flowers” — wasn’t it uttered by Cary Grant in “The Philadelphia Story” when recommending an after-party “eye-opener”? Just wondering! Hello Ms. Siberry, You are correct! “The Philadelphia Story” was written by Phillip Berry, a frequent guest of the Murphy’s. I believe the phrase also shows up in “Tender is the Night.” They were, to say the least, an inspiring couple. 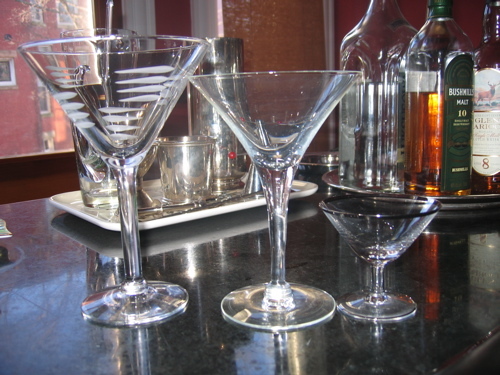 I was fortunate to be given (as a gift) two single martini size glasses, and a lovely stainless shaker, a few years ago. It probably kept me from becoming a drunk. But double martinis (and larger) are a travesty. The drink gets too warm by the end–far better to indulge in a single and, if one is still thirsty, to construct a second, rather than pour a big one. The process of making a martini is a ritual, after all, and enjoyable all by itself. Hi, where the martinis at a 3 martini lunch drunk with the meal or before the meal as a coctail? Hello Anna and welcome. I believe they were drunk throughout the meal, perhaps even in place of it. But I could be wrong.